At first it might sound strange, but when you think about it, accounting for pets in your will actually makes quite a lot of sense. After all, for many people they’re a part of the family. It’s only natural to want to make sure animals are well looked-after when you aren’t around, and in the US, pets in wills are at a record high. In fact, according to the Wall Street Journal, 9% of all cat owners in the United States actually have their pets written into their wills, which is a 3% rise over the last couple of years. The same figure is true for dog owners, though this figure has grown by 4%. There’s certainly no sign of the trend slowing down, and we may start seeing pets become commonplace in wills. What’s important to understand of course, is exactly how it all works – there can be a lot of misinformation, and nobody wants the thought of disputes occurring while a pet needs caring for. Companies such as Will Claim Solicitors would have to be consulted if it was thought that there was an issue with the will. Fortunately, in 46 states, there’s provision for what is called a ‘pet trust’, which is designed to make sure that the money left to look after a pet is used properly, and that the pet is looked after until the end of its own life. As state law considers pets to be property, assets can’t actually be left directly to them, so the case is often that people simply leave money to a designated caretaker. The problem with this is that there isn’t actually any legal obligation for this caretaker to keep the animal, or even to use the inherited money for its care. The difference with an actual pet trust is that is handled by a trustee, who is legally obligated to act in the best interest of the cat, dog or whatever animal it may be. They can then make sure that the designated caretaker is doing their job, and in some cases they also play the role of caretaker. These plans aren’t only used by super-wealthy individuals either; many normal earners simply leave enough for food and vet bills for when they’re either gone, or incapable of giving care. 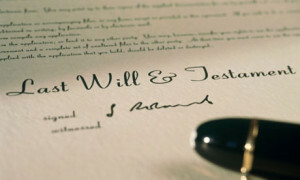 Will you be writing your pet into your will?